Experience the vibrant and exciting celebrations which make up Cape Verde’s most famous Carnival. If you’d like to take a short break from your beach holiday in Sal to experience an explosion of colour, music, dancing and festivities, visit Cape Verde during Carnival! Held 40 days before Easter on the island of São Vicente, this event really highlights what the island is known for – music! The streets and main square of Mindelo come alive with large floats and processions of glamorous dancers in Mardi Gras costumes, each competing to be the best. The atmosphere which takes hold of the town before and during the Carnival is truly infectious, and locals can often be seen practicing and perfecting their dance routines and costumes in preparation. When Carnival takes hold, the music and dancing often goes on until the early hours, so this is an experience best suited to those who are ready to embrace the festivities and get stuck in to local culture and celebrations! Staying at the Oasis Porto Grande Hotel means you’re in a great position to get involved with the Carnival celebrations, right on top of the main processions and in the heart of it all! You might want to upgrade your room to the 'Square facing' rooms if they are available, which means you will be able to enjoying great views from your balcony - just remember that the noise comes with the view! With beautiful green peaks, jaw-dropping ravines and impressive cliff-hanging towns, just an hour’s ferry ride away is Santo Antão. As part of this Carnival package, you’ll enjoy a full day’s tour of the island, weaving amongst the mountains, visiting a local liqueur distillery and towns such as Ribeira Grande, clinging to the edge of mountains. Be sure to bring your camera, the landscape here is phenomenal. You’ll also get an evening to explore Mindelo, where we’ll show you around and take to you a typical restaurant where you can enjoy live music and an inclusive evening meal. Your half day tour of the island will involve a drive 750m up to Monte Verde (meaning green mountain), the island’s tallest mountain. From here, the panoramic views across Mindelo and beyond are breathtaking. You’ll visit some of the island’s most dramatic and varying coastline, as well as passing fishing villages and markets. Parties are held in Oasis Porto Grande hotel before, during and after the Carnival. These parties are open to guests and the general public and take place on the terrace, involving lights and music playing until the early hours of the morning. Tickets to these parties normally go on sale two weeks before Carnival and are priced at approximately €20pp. Monday evening is the parade of the School of Samba Tropical, which ends at Oasis Porto Grande hotel. If you wish, you can pre-book your evening meal at the Lobby Bar in advance (tickets normally on sale two weeks in advance, priced at approx. €15pp). Tuesday (main Carnival day). As part of your package, we have pre-booked your lunch at the Lobby Bar in Oasis Porto Grande, a perfect spot to watch the main parade. Guests staying at Oasis Porto Grande usually have free access to one side of the terrace at the front of the hotel in order to watch the parades. The terrace will be very busy during these times, as is the whole of Mindelo during Carnival time. This 4-night add on package is not bookable online, however please contact our experienced sales team, who will be able to tailor make your holiday to include this wonderful once a year experience. This Carnival Package on the island of São Vicente is a 4-night add on package to your main holiday in Sal. Inter-island flights are provided by Binter. 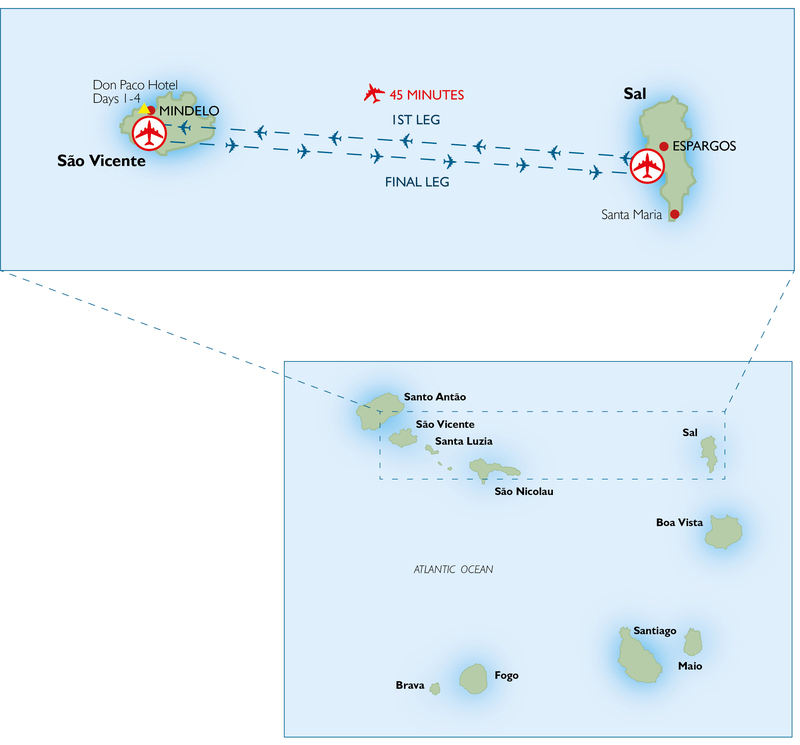 This 4-night add on departs Saturday 22nd February 2020 from Sal and returns to Sal on Wednesday 26th February 2020. 4 nights Bed & Breakfast staying at Oasis Porto Grande Hotel (see the accommodation section below). We have chosen Oasis Porto Grande Hotel for this 4-night holiday add on package so that you are based in the centre of the festivities. During carnival, the atmosphere is buzzing, and the partying in the street is something not to be missed. Being based in Mindelo, the hotel will be much noisier than at other times. Please Note: The room type included is a standard room which are situated at the rear of the hotel. Rooms available at the front of the hotel (Square facing rooms) are on request, at a supplement. Please discuss this at the time of booking with our team. Should you prefer a quieter option, Foya Branca is situated 10 minutes' drive from the main centre, and provides a regular, free shuttle bus service from the hotel, providing the best of both worlds – close to the action, and a restful nights' sleep.